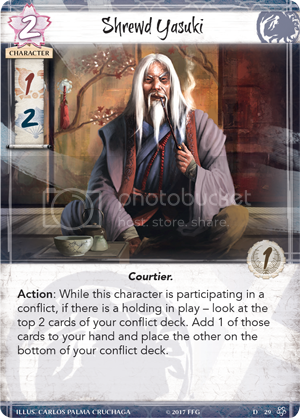 Action: While this character is participating in a conflict, if there is a holding in play - look at the top 2 cards of your conflict deck. Add 1 of those cards to your hand and place the other on the bottom of your conflict. Card draw is always good. It looks like they tried to balance the design of this card by forcing his controller to have him in battle.